Rosebank College’s commitment to cultivating a learning culture of empathy and awareness of others came to fruition through two Immersion Programs undertaken by students and teachers. The first was the Santa Teresa Immersion Experience, coordinated by The Good Samaritan Education Mission Team. 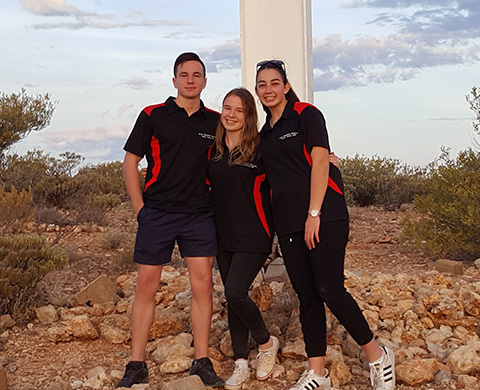 The three Year 10 students (Molly Hayes, Susanna Gillard and Colm O’Niell) and teacher Dr Paul O’Shea, joined their peers from Good Samaritan Schools in NSW to learn about and vicariously live the life of the Indigenous community of Ltyente Apurte in eastern Arrente country, about 80 kilometres south-east of Alice Springs. The experience aimed to raise the student’s awareness of social justice in the wider world and the call to action this awareness requires. This was achieved by visiting places of historical and cultural significance within and around the community and participating in traditional activities. The second was the Good Samaritan Education Staff Immersion to the Philippines. Mrs Philomena Middeldorp represented Rosebank College. During their time there, the teachers spent time at the Good Samaritan Kinder School, the Community Centre, Holy Innocent’s Orphanage, the “Boulevard”slum area, as well as enjoying social and cultural experiences in Bacolod and Manila.